1 of 4 Bring a large pot of lightly salted water to boiling. Add pasta and cook 7 minutes. 2 of 4 Meanwhile, place spinach in a mini chopper or food processor. Pulse to chop. Add pesto and continue to process until smooth. Set aside. 3 of 4 Add broccoli to pasta after 7 minutes of cooking, and continue to cook an additional 4 minutes. Drain pasta and broccoli, reserving a little pasta water. 4 of 4 Coat same pot with nonstick cooking spray and place over medium heat. Add tomato halves and cook for 1 to 2 minutes. 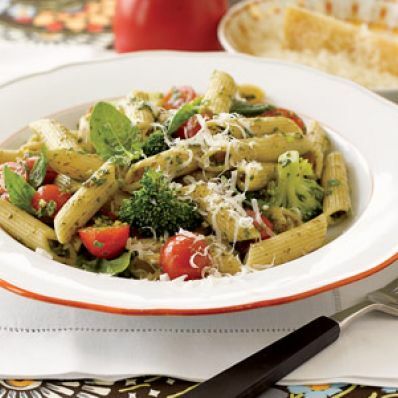 Stir in drained pasta, spinach pesto and a little of the pasta water until all are coated nicely with sauce. Transfer to a large serving bowl and top with grated Parmesan, if desired.